Jameis Winston has won a Heisman Trophy and led his team to a national championship, but has been involved in some highly publicized incidents. Photo courtesy of ABCNews.com. PHILADELPHIA-I’m going to start my column on Florida State quarterback Jameis Winston with a memory from my days as a 20-something student at Morgan State University, so bear with me. Like a lot of college students, I mixed various extra-curricular activities such as working as a sports anchor at Morgan’s radio station WEAA, maintaining a part-time job, hitting the parties and checking out the ladies along with my classes. In other words, I was your basic college student. While I had good grades, I also had a bad habit of waiting until the last minute to turn in assignments and get ready for tests. It caught up to me one day in my Political Science class. I had to make a presentation and after two minutes of fumbling through a poorly prepared speech, my instructor, Professor Grant, decided that he’d had enough. He told me to sit down, chastised my presentation as an “abysmal failure” in front of all my classmates and left me feeling kind of embarrassed for the rest of the class period. After class, Professor Grant took me and a friend out to lunch. He said that he expected more of me and that being unprepared on the job or in graduate school would lead to my feeling a whole lot worse than it did that day. To his credit, Professor Grant allowed me to re-do the presentation. But even if he hadn’t, I couldn’t get mad at him because he was right. When he took me to the woodshed in public, it was something that my hard-headed self needed to have happen. It also lit a fire under me and made me remember to stay on top of things in all aspects of my life. Now I admit that I didn’t have as much going for me as Winston, who has a Heisman Trophy and a national championship under his belt and led the No. 2 ranked Seminoles to a comeback win over Notre Dame last Saturday. But I’ve been 20. I’ve been hardheaded. I’ve come real close to blowing it. And I’m hoping that Winston’s Professor Grant is on the way because if he doesn’t, things could get ugly. While Winston has spent a lot of time on the sports pages, which is good, he’s also spent some time in the news section, which isn’t. 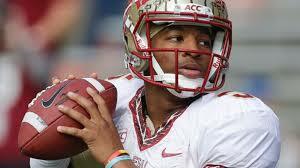 Between an accusation of sexual assault for which he was never charged, shoplifting $32.00 worth of crab legs, yelling out obscenities in the Student Union, and an accusation of signing and selling autographs–a big no-no for the NCAA–Winston is getting a lot of the kind of attention that a skittish National Football League already reeling from the domestic violence and child abuse incidents of Adrian Peterson and Ray Rice doesn’t want. In fact, it’s attention that’s already impacting his draft status. NFL Draft pundits say Winston’s draft stock is falling because while his talent is first-round, his character is third or possibly fourth. When you play quarterback in the NFL you are the face of the franchise and the owners don’t like risking millions of dollars if you have a tendency to get in trouble. Former Heisman Trophy winner Bo Jackson, who like Winston is from Bessemer, Alabama, tried to talk to him in the same emphatic way a parent would before the crab leg incident and didn’t mince words with the young man. Jackson received some shade from Florida State head coach Jimbo Fisher and more than a few people on Facebook and Twitter because they felt Jackson was butting in unnecessarily or he was being too exacting on the kid. But I’m not mad at Jackson for trying to be Winston’s Professor Grant. The purpose of ruffling Winston’s 20-something feathers a little bit to make him a better person and a better man. We need more “old heads” like Jackson to get into the face of kids like Winston to let them know that they still have a lot to learn about life. Winston is on that athletic conveyer belt that New York Times sports columnist William C. Rhoden refers to in his book, “Forty-Million Dollar Slaves,” where sometimes the indiscretions and shortcomings of ball players are overlooked because of their athletic prowess. That often times leads to trouble that athlete can’t always get themselves out of because no one dared to say, “No” or You can’t do this or that. We were all foolish 20-somethings once on some level and there was an older person—an uncle, aunt, cousin, or some other mentor to light a fire under our rear ends to make us better people. I have seen far too many talented young people, especially young African-American males, with the world in front of them make too many bad decisions that ended up costing them their careers and even their lives. I covered the story of the death of University of Maryland basketball star Len Bias, who had no history of getting into trouble, but made one bad decision, using cocaine, that cost him his life. It was one of the toughest stories I’ve had to cover in my journalistic career because it didn’t have to happen. While many scoff at the whole idea of a “village” being needed to raise a child, I believe it’s true. I don’t know Winston personally, but I get the impression that at his core he’s a good kid in need of some guidance. His problem is one of maturity more than anything else. I just hope that he finds someone who is strong enough to tell him the truth and help him grow as a man. I hope he finds his Professor Grant. ← The Boys are Back in Town: Dallas Is Hot, But Can They Keep it Going?